CULVER CITY, Calif. (June 16, 2014) - The world's most popular web-slinger returns when The Amazing Spider-Man 2 arrives on 3-disc Blu-ray(TM) 3D Combo Pack, 2-disc Blu-ray Combo Pack and DVD Aug. 19 from Sony Pictures Home Entertainment. Andrew Garfield and Emma Stone reprise their iconic roles as Peter Parker and Gwen Stacy, who face their most dangerous adversaries yet. In The Amazing Spider-Man 2 , Peter Parker finds there's no feeling quite like swinging between skyscrapers, embracing his role as New York City's hero and spending time with Gwen. But being Spider-Man comes at a price: only Spider-Man can protect his fellow New Yorkers from the formidable villains that threaten the city. With the emergence of Electro (Academy Award(R) winner Jamie Foxx, Best Actor, Ray, 2004), Spider-Man faces his greatest battle yet. Marc Webb returns to direct The Amazing Spider-Man 2 , which also stars Dane DeHaan as Harry Osborn (a.k.a The Green Goblin) with Academy Award(R) nominee Paul Giamatti (Best Supporting Actor, Cinderella Man, 2006) as Aleksei Sytsevich (a.k.a. The Rhino), and two-time Academy Award(R) winner Sally Field (Best Actress: Norma Rae, 1979; Places in the Heart, 1984) as Aunt May. 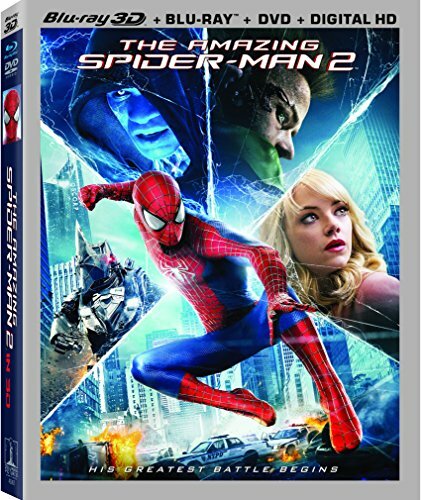 Fans will be excited to explore the Blu-ray exclusive bonus features, which include the six-part, behind-the-scenes documentary, "The Wages of Heroism: Making The Amazing Spider-Man 2," which includes more than 100 minutes of immersive featurettes detailing the heroic efforts needed to bring the film to life. Exclusively available on Blu-ray are nine all-new deleted scenes with commentary by Marc Webb, including the scene "Peter Meets His Father." Both the Blu-ray and DVD versions of The Amazing Spider-Man 2 include a Filmmaker Commentary, four deleted scenes and Alicia Keys' "It's On Again" music video. It's great to be Spider-Man (Andrew Garfield). For Peter Parker, there's no feeling quite like swinging between skyscrapers, embracing being the hero, and spending time with Gwen (Emma Stone). But being Spider-Man comes at a price:only Spider-Man can protect his fellow New Yorkers from the formidable villains that threaten the city. With the emergence of Electro (Jamie Foxx), Peter must confront a foe far more powerful than he. And as his old friend, Harry Osborn (Dane DeHaan), returns, Peter comes to realize that all of his enemies have one thing in common: Oscorp. * 9 Additional Deleted Scenes with Commentary by Marc Webb, including "Peter Meets His Father"
* "Lessons Learned: Development and Direction" - Filmmakers and cast discuss their approach to the sequel and their efforts to make it the best Spider-Man yet. * "Heart of the City: Shooting in New York" - A behind-the-scenes look at the film's unprecedented access to New York City during production. * "Triple Threat: Attack of the Villains" - An inside look at the development of Spider-Man's fearsome foes, Electro, the Green Goblin and Rhino. * "A More Dangerous World: Transforming Electro and the Green Goblin" - From make-up to costuming, see what it took to transform Jamie Foxx and Dane DeHaan into their fearsome alter-egos. * "A Bolt From the Blue: Visual Effects" - Sony Pictures Imageworks artists and animators show how they created the gravity defying, web-slinging and pumped-up action in the new film. * "Spidey Gets His Groove Back: Music and Editing" - Learn how the film's soundtrack and score came together in this behind-the-scenes look at jam sessions with Composer Hans Zimmer and the team of master musicians he assembled, including Pharrell Williams, Johnny Marr, Michael Einziger and more. The Amazing Spider-Man 2 has a run time of about 142 minutes & is rated PG-13 for sequences of sci-fi action/violence. "Academy Award(R)" is the registered trademark of the Academy of Motion Picture Arts and Sciences.